Are you unsure what type of 8mm camcorders you should be looking for? Converting 8mm video tapes like Video8, Hi8, and Digital8 tapes can actually be pretty confusing, especially if you have different types of tapes. Having multiple different tape formats can cause problems because not all camcorders are capable of playing each format. The earlier camcorders are typically only able to support Video8 and Hi-8 tapes. I’ve compiled a list of Sony camcorders that will support all formats of 8mm tapes. These are the best camcorders to look for if you plan to transfer video tapes to DVD or your computer. Post in the comments what camera you prefer, or use to transfer your camcorder tapes to DVD! This entry was posted in General, Video Tape Transfer. Bookmark the permalink. All camcorders listed above support all 8mm video tape formats simply by hooking up to your standalone DVD recorder. Bought 2 cameras on ebay, sony trv340 and trv460. The sony trv460 could not play back my old 8mm tapes at ALL! no sound and no picture, camera was not defective cause it could record new video and play that back. The sony trv340 could play back my old 8mm tapes but with no audio, this unit also wasn’t defective cause it could record new video and play that back flawlessly. So if you have some old video 8mm tapes shot on one of those 1st generation camcorders you might run into some problems. Next I’m going to try the Sony TRV103, reviews state that this camcorder can actually play back your ancient 8mm tapes. 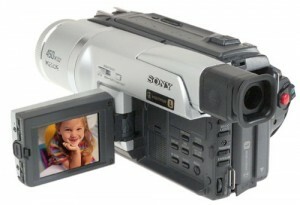 The SONY TRV480 also supports Digital8 as well as Hi8, Video8, and 8mm. Will any of these camcorders above allow you to transfer standard Video 8 to a PC or MAC digitally? Our daughter now 25 would like her hi8 mm baby video saved . I am looking at a TVR 103 and a TVR 330. I wish to read up on converting them and burning DVDs for her. I was going to use our Mac withe Firewire. I use the metal particle or FUJI tapes..but find that you cannot use both makes in same camcorder(HI8) with manual focusing ring!….as the recording heads are not the same format..hence my fortunate luck in having a cleaning tape…. (are there any more on the market…? Which of these are PAL models and which have the Analog-to-digital passthrough? Will a Sony DCR-HC28 play my HI-8 videos made with a Sony CCD-TRV318? Please help, I am not techno savvy, at all! I have a DCR-TRV130e but its not playingback older tapes. Is there a diffrences with DCR-TRV130 and DCR-TRV130e? Kindly send me which Sony camcorder model supported my Video8 cassettes. Hey you seem to be missing a camcorder i have. Ive been trying to find out more on the one i have which is a sony ccd v3. Theres a huge lack of info on it and was curious to see if you know anything on it.